Apple’s online store was down this morning—usually a signal that some new products are on the way. And lo, Apple did not disappoint. Around 8:30 am EST, the store went back online and two new iPads appeared: the iPad Air and the new iPad mini. Nuts and bolts first: The 10.5-inch iPad Air starts at $500 for the wifi only model ($630 for the cellular version). It has a Retina display, measures 6.1 mm thick, weighs in at just a pound, and features 10 hours of battery life. It also has an 8 megapixel back camera, a 7 megapixel HD selfie cam and is powered by Apple’s A12 Bionic chip. Apple claims that gives it a 70 percent boost in performance, and twice the graphics capability. Compared to what? Apple doesn’t say specifically, but probably previous iterations of the iPad. The new 7.9-inch iPad mini. Now with Apple Pencil. 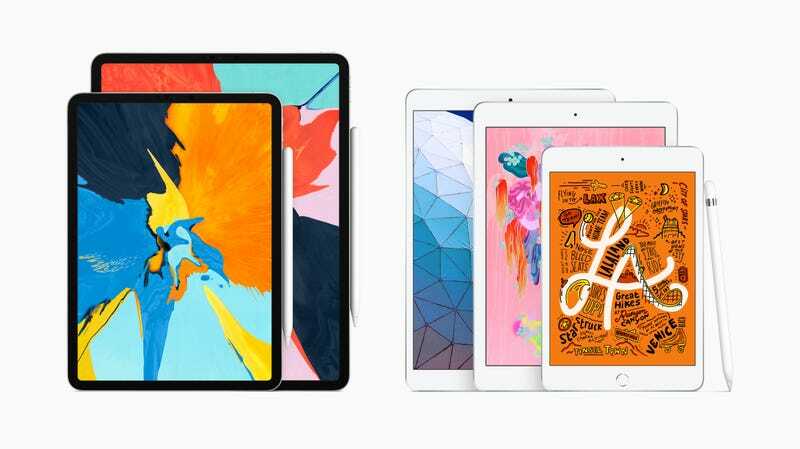 It’s an interesting move to drop these two iPads just a week before Apple’s event on the 25th. After all—why not just drop these babies on the big stage? Possibly, as some have suggested on Twitter, it would distract from the news and streaming services Apple’s set to announce. In any case, both new iPads are available for order online starting today and will hit stores sometime next week. You know, in case you feel like having something new and shiny to stream Apple’s content on.